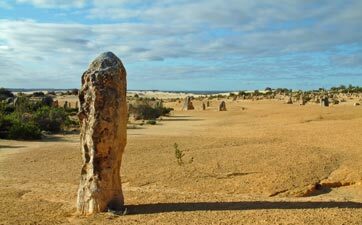 Nambung National Park lies on the Western Australian coast near the town of Cervantes. 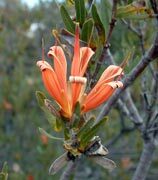 It is a place of heath and woodland vegetation and in springtime is a blaze of colourful banksia cones, which light up like squat candles as you drive across the shrubby landscape. 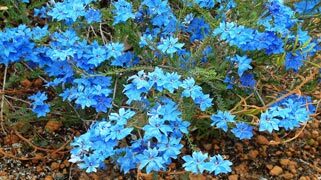 Apart from the flowering shrubs, there are many wildflowers that grow in heathland gaps and on roadside verges - including the Leschenaultia, arguably the most beautiful of blue-flowering plants. 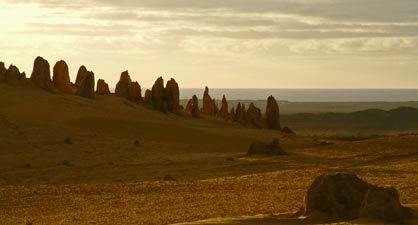 Nonetheless, if you mention Nambung, most people don't know what or where you are talking about, but say "The Pinnacles" and there is instant recognition. 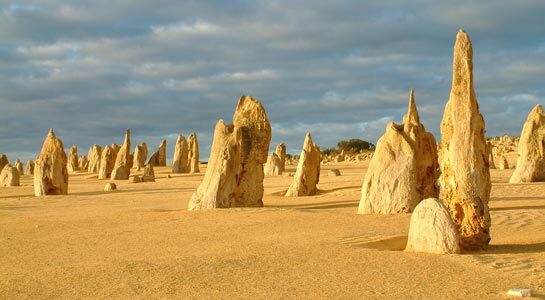 This feature of the national park is what attracts visitors; a vast area of sandy dunes dotted with the remnant pillars of an old bed of limestone. And so, in 2002, we did likewise, stopping off at the backpackers in Cervantes on our way back to Perth from Kalbarri as our base to explore. 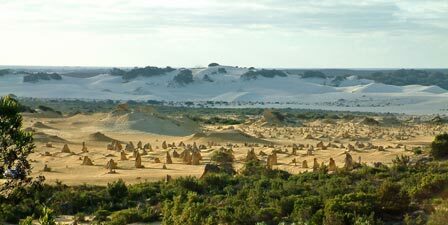 There is one other unique feature of the Nambung landscape. 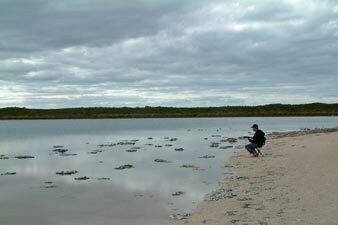 Near Cervantes lies Lake Thetis, a small hypersaline lake fed by underground water and home to 2,000 year old stromatolites. 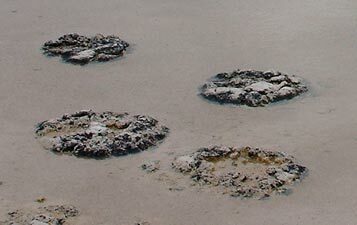 When we visited in 2002, it was the first time that we saw these curious structures, formed by cyanobacteria thought responsible for the generation of oxygen in the earth’s atmosphere. When we arrived at the lake, we were alone, apart from a solitary person sitting on a chair and playing a guitar. 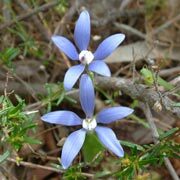 The idea of such innocuous organisms making life on earth as we know it possible was enough to inspire him to drive over 3000km from Melbourne to see them and sing to them at dawn. We stopped and listened to the gentle tones of the guitar floating across the water - somehow it seemed an appropriate gesture. 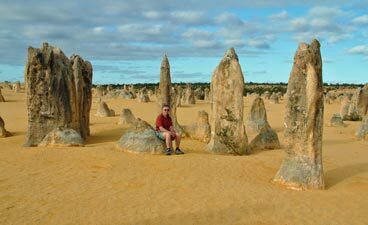 In the afternoon, we headed down to check out the surreal landscape of The Pinnacles Desert. 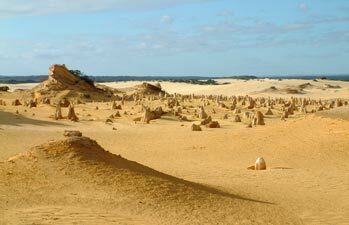 Here, thousands of limestone pillars, up to 4m tall, rise out of the yellow sands. 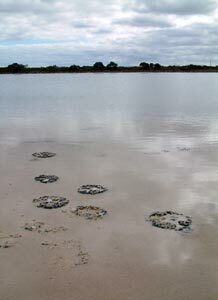 Rain leached the lime-rich dune sands to form a hard layer of calcrete over softer limestone. Cracks in the calcrete layer were exploited by roots of plants colonizing the dune system, which further enhanced the leaching of soft limestone in the root zones. The channels created filled with sand and, when the vegetation eventually disappeared, these pillars were exposed by wind erosion of the sand from these channels. 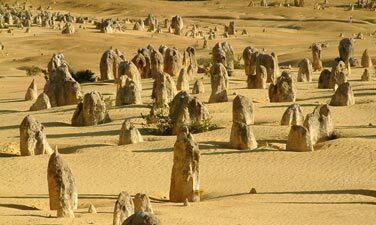 This is a rather dry explanation for a landscape more evocative of the remnants of a lost civilization, and one that has inspired musicians to travel thousands of kilometres to perform moonlight concerts amongst its pillars. We wandered slowly along a circuit that wound up and down the dunes past pillars of diverse shapes and sizes, some clustered and some alone in splendid isolation. In the distance the the immense white dunes of the White Desert framed the spectacle. When we arrived the sun was shining weakly through the high cloud, flattening the landscape. 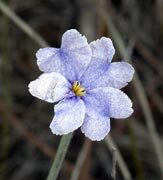 However, as it descended it emerged beneath the clouds in the west. The limestone columns almost glowed in the intense afternoon light or formed dark silhouettes when framed against the western sky. Either way, in that particular stillness of approaching evening, the ambiance was magical. 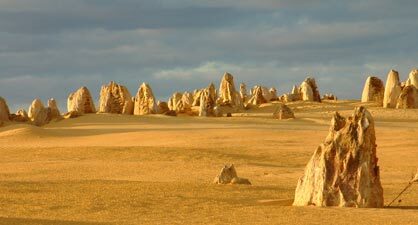 Late afternoon is definitely the best time to appreciate the stark beauty of The Pinnacles.